Protecting homes and businesses in the Hunter Region for over 20 years. Recently, the manager of a large sports facility asked us to quote. We inspected the space, understanding the various parts of the building and identifying the areas of highest pest activity. Then we designed an Independent Pest Management (IPM) program. She was impressed that, unlike other companies she had contacted, Universal didn’t just look at the space, quote on the overall job and hope for the best. Instead we isolated specific areas, noting the areas of greatest heat and vulnerability to pests (like kitchens and storerooms) and developed a custom plan, outlining materials, time and coverage. Blasting the entire space with a uniform treatment would be ineffective, costly and (excuse the pun) OVERKILL! Integrity and professionalism. That’s the difference Universal makes. Contact us today. Pest Control Professionals Who Are Friendly to Humans. 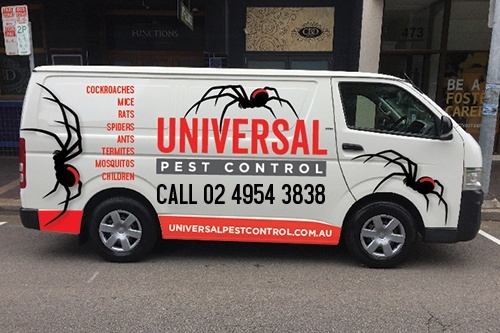 Universal Pest Control professionals don’t treat our clients like the pests we target. Instead we take the time to understand and explain your pest situation, identifying the size of the population and its source. We also provide advice on ways to avoid attracting pests and ways to manage the problem going forward. We are thorough and thoroughly professional. Pests hate us (but clients love us). Tony established Universal Pest Services more than 18 years ago, seeing the need for greater professionalism and personal service in the industry. Of the many pests he has encountered, he takes great pleasure in eradicating the prolific German Cockroach, which wreaks havoc on unsuspecting homeowners around the region. He is passionate about seeing young people reach their full potential and enjoys investing time and energy in the local community through junior soccer and cricket. Alexx joined the Universal team in 201 and is fully accredited and licensed for pest control and termite inspections. He puts customers at ease with his honest and friendly disposition and commitment to providing a thorough and professional service. He loves to eradicate spiders and termites. When not hard at work with Universal Pest Services, Alexx appreciates the beach, luxury cars and spending time with good friends. Jodie keeps Universal Pest Services running smoothly, managing scheduling, accounts, invoicing and payroll – as well as everything else. Outside the office, Jodie loves spending time with her family and her beloved Moodle puppy.